As the NHL's centennial year is coming to a close, yet another celebratory book is hitting the stores shelves. 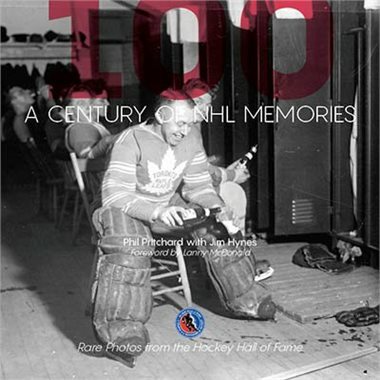 100: A Century of NHL Memories is a beautiful coffee table book full of some of the greatest photographs in the history of hockey. There are over 150 pages of spectacular photos, both in black and white and in colour, covering the NHL's entire 100 year from 1917 to 2017. The photos all come from the Hockey Hall of Fame collection, and are simply to be marvelled at. Accompanying the still images are the words of Phil Pritchard and Jim Hynes as they explain the importance of each captured moment. Hockey Hall of Famer Lanny McDonald provides the foreword. Combined though the lenses of photographers and the words of our authors, the story of the NHL's 100 years is told. Sometimes coffee table books can be flipped through in no time at all, but I was enthralled by this book. It took me days to write this review because every time I picked up the book I would get lost for hours in the imagery and text. That is the sign of an excellent hockey book.